Now, you may recall that last week we took a visit to see one of my all-time favourite musicals, Chess, and that it was not an entirely enjoyable experience as our upper circle seats were most definitely ‘restricted’ although not sold as such. The show was fantastic, as I expected, so I took a very rare decision to pay for a more expensive ticket, and revisit the show to see what I was missing. I’ll talk a bit about pricing at the end of this piece. The difference between viewing the show from a seat in the upper circle, row J, in the central block, and a seat in the dress circle, row E, at the side, is like night and day. In the case of this production of Chess, the effect is like watching a completely different show from a design point of view. Just look at the difference here; last week’s view first, then last night’s view. The ENO’s annual musical has become a big event of limited runs: we have had Sweeney Todd, Sunset Boulevard, Carousel, and now Chess. These are generally big productions with star names, and for the last two years, they have been fully staged. None of these were ‘new’ musicals to me, and in fact all have been long-time favourites, and Chess is no exception. I talked a bit about the casting for Chess last week. Musical theatre veteran Michael Ball has been cast as the Russian challenger, Anatoly Sergievsky. Rock singer and musical star from Canada, Tim Howar, is the American champion, Freddie Trumper (an unfortunate surname right now with the current President). Actress/singer Cassidy Janson, who has led in small musicals and covered in larger ones, is Florence Vassy, Freddie’s second and girlfriend of seven years. X Factor winner turned musical belter Alexandra Burke is Svetlana Sergievska, the wife of Anatoly and mother of their son Ivan. Phillip Browne is the Russian second, Molokov, a KGB operative and a sinister bass. Cedric Neal comes from Broadway and a leading role in Motown the Musical to portray The Arbiter, the judge and referee of the Chess Federation tournaments we see. In the last post I referred to the casting drama during rehearsals which saw Neal brought in at short notice to take over the role (hard on the voice, but underwritten). There was an additional event which affected the first preview, when Tim Howar’s wife gave birth to their son Hamish during Act One, which meant the understudy had to take on Act Two (including the big solo number, Pity The Child, and some tricky moments of recitative). There have also been reports of Michael Ball missing some lines in the Endgame number which has all the principals together for the last time, but no such problem was present last night (although his “Frederick, thank you” in the close of The Deal/No Deal number has now switched to “Freddie”). So what’s ‘new’ if you are in the lower levels? First off, there is a platform which comes up during key scenes, and this is located in the pit, where the orchestra is usually based. Honestly, from the upper circle last week I had no clue this was even there, nor did I realise that some of the chess board set design was made up of steps which allowed some characters to exit quickly or for technicians to nip under the stage to set up the next scene or the video projections. Second, without a clear view of the front of the stage you miss around half of the choreography of The Soviet Machine, roughly a third of One Night in Bangkok, and you are unable to see the chorus behind the screen in The Story of Chess, or the chorus based under the platform during the chess games. This does a great disservice to the hard working singers and dancers who deliver the layered melodies and high energy movement the ensemble numbers require. This time I hardly glanced at the video projections (which are sometimes mirror images of the same scene in close-up, but sometimes seem to be there just so you can see what is going on – for example, in Burke’s two solo numbers, in Janson’s two solo numbers, and -with some synch problems last night – for Howar’s big Act Two number). I found them distracting in the major duets I Know Him So Well and Mountain Duet, as that by definition requires two people to be shown, and the screens seemed superfluous. In other places they are used well – the plane arrival in Merano, the fire-breathing dragons in One Night in Bangkok in front of which acrobats and aerial contortionists perform, the chess games (although, rather than 1960s headlines about the space race, it might be fun to show us the actual moves, assuming they are not just random! ), and the explanatory pictures about the history of the game and former champions. Last night I could watch close-up, on the stage itself, what was going on. I still can’t find any emotional engagement with Svetlana – she appears briefly early on in the show, and then we don’t see her again until the end of Act One, in which we are supposed to empathise with her delivery of Someone Else’s Story. This song was written for the character of Florence (in the original Broadway production), and still makes more sense, as she finds one relationship collapsing as another begins. Neither female character is fully drawn, but I find Florence an interesting one. She is Hungarian-born and living in the US, with a self-centred lover who treats her as an accessory, although she’s fiery in support for him when we first see them. Why she’s stayed so long, and why she suddenly bails to join with a refugee from a country she hates, is not explored sufficiently, nor the reasons this Russian leaves his family for a new life in the West. Janson seems to make Florence fluffy in love by the time we get to Heaven Help My Heart, which makes the You and I duet between her and Anatoly bittersweet by its conclusion. Perhaps the implication is that Freddie’s drinking and coke sniffing had made him less exciting between the sheets than the focused Russian! Svetlana has another song which opens Act Two, a translation of the Swedish production’s song He Is A Man, He Is A Child, which is a towering ballad for a character we don’t really know. But without those two songs, it isn’t much of a part, regardless of the engagement the audience would have with her. Burke does well enough and is very good indeed in Endgame, and she’s a hard woman to return to, for sure. Michael Ball probably wouldn’t have been my first choice for Anatoly, but with his spectacles and air of concentrated ennui, he does convince – and the songs, Where I Want To Be, Anthem, and the duets previously mentioned, are delivered well, without too much of the vibrato that has characterised his recent collaborations with Alfie Boe. Hopefully we will see him in some more mature musical roles as time progresses. Anatoly, though, is a difficult proposition for any actor – he appears emotionless, he hates the West and everything Freddie Trumper represents, then beats him in the championship and steals his girl. It’s to the credit of the writers and the actor that we still feel some connection with him, and don’t dismiss him as a selfish sot. Freddie is another conundrum – clearly focused on the game of chess, but highly-strung and feted (and behaving) like a rock star, from the moment he touches down in Merano. His songs range from massive power force fields like Pity The Child to cynical rap in One Night in Bangkok. He throws things around and hurts people who get close to him; he is by no means the confident front he puts on. It’s a tough part because it isn’t the one which gets the natural audience sympathy, but he’s always been my favourite character in Chess, and he’s pitched just right in this, with a redemption arc in The Deal/No Deal which might, despite Florence’s pointed look during the TV interview which opens Endgame, lead to some form of reconciliation for them. The ensemble numbers are absolutely fine, and well done, and from close-up they were very enjoyable. The orchestra from the ENO is conducted by John Rigby, and musical director is Anders Eljas, who has been involved with the musical since square one, doing the original orchestrations, and what a glorious sound they make. As for the ensemble, let’s have a shout out for the pop choir trio Jordan Lee Davies, Sinead Lang and Alexandra Waite-Roberts, and associate choreographer Jo Morris, although all are excellent. I mentioned the pricing. The upper circle pricing is £65-80, and the dress circle will cost you over £100 for a ticket. I hear that there are rush tickets for £25 through TodayTix for weekday performances, so this would seem to be the future of such shows – eye-watering prices for committed fans, and cheap tickets for casual ones. I find this a worrying trend as a theatre obsessive, and one who nearly always puts hand in pocket for pre-discount prices. If I visited a show on a cheap ticket or a comp, I would tell you. It’s a rare occurrence, but if you are in the happy position to not have to plan your visits to a show until the day itself, it’s an option to play the discount lotteries. Chess continues for another three weeks. I love Chess. It’s the concept album I’ve played the most, and I think it has one of the strongest scores in musical theatre. With music by Bjorn and Benny from ABBA, and lyrics from Tim Rice, it started life in 1984 as a recording, before progressing to the West End stage in 1986. It ran for four years before going on tour within the UK, and there was also a Broadway production and others, including one in Sweden, which is available on DVD. A concert version played at the Royal Albert Hall in 2008, also recorded for DVD, and a high camp tour ran in 2010. Now the musical returns to London for the first time in nearly thirty years, and in this staging relies heavily on the structure of the original concept album, with the addition of Someone Else’s Story from the Broadway production, The Soviet Machine from the London production, and He is a Man, He is a Child from the Swedish production. Cast as originally announced: Murray Head, Cassidy Janson, Alexandra Burke, Phillip Browne (Molotov), Michael Ball; with Tim Rice, Benny Andersson, Bjorn Ulvaeus, and director Laurence Connor. Photo credit: Frederic Aranda. There was a bit of off-stage drama before rehearsals got going for the new production, with original London cast member Murray Head, cast as The Arbiter at the age of 72, having to leave for personal reasons. I admit he was a major draw for me when booking, so I was a little sad to hear of his withdrawal, but if you want to see him at the height of his powers, you can find the promo videos of Pity the Child and One Night in Bangkok and the Swedish TV broadcast of the truncated Chess in Concert online. The story of Chess is both simple (a game of chess between an American and a Russian, West vs East, freedom vs oppression) and complex (the American’s partner and second, Florence, a Hungarian by birth, has a father who disappeared during Soviet occupation; the Russian has a wife, Svetlana, and child back home but walks away from them for the love of the game and asylum in England). Tim Howar and Michael Ball. Photo credit: Brinkoff-Moegenburg. At the time of the concept and first production, the Iron Curtain was still a reality, and the ‘Red menace’ was still a very real threat to the freedoms of the West. The West, represented by the brash USA, was seen as materialistic and superficial, while the East was viewed as repressive, inflexible, and unemotional. When Chess was first conceived, it was a reflection of its times, mixing camp and overblown numbers with political commentary. It was also a hit album, with at least two huge chart hits (I Know Him So Well and One Night in Bangkok). This production casts widely – the Russian (Anatoly) is played by musical veteran Michael Ball, a tad too old for the part but on good form in both acting and singing terms, sporting glasses and an unruffled expression, even when falling in love with Florence. She is played by Cassidy Janson – we saw her in Beautiful: The Carole King Musical where she impressed with her high octane energy and vulnerablity, qualities which serve her well as Florence, who moves from one chess-playing lover to another and ends up believing “stories like ours / have happy endings”. The American (Freddie) is Mike and the Mechanics lead singer Tim Howar. I wasn’t familiar with him but he puts across the obnoxious front of the man who is a hurt little child inside, and he has a powerful set of pipes which stop the show with Pity the Child (I understand that earlier performances had issues with pacing due to extended applause for this number, but on the performance last Saturday afternoon the lights cut to black directly afterwards, curtailing any audience appreciation. Svetlana, not usually a major role, is played by pop singer Alexandra Burke, who has a belt of a voice but limited acting skills. At the age of 29 she is far too young for her 55-year-old Anatoly, and her drab – but accurate – Soviet costumes have attracted comment from those who probably seek to see her in sparkles. Aside from one brief scene at the beginning, she does not appear until the end of Act One, when her character is given the song of Someone Else’s Story, which makes much more sense for Florence. There are several chorus numbers – the opener is The Story of Chess, led by The Arbiter (now played by Cedric Neal, who gives yet another dimension to the complex yet underused role), followed by the tongue in cheek cavorting of Merano. There are video projections throughout the production, but aside from showing a plane arrival during this number, and a sequence of slick merchandising product during the American cheerleading number, they are mainly utilised to show blow-up film of what is going on before us on stage. I enjoyed the British Embassy number, which is hopelessly dated, but very funny, and the acrobats, strippers, and pole dancers of Bangkok, with fire, masks, and that cheesy rap. The orchestra and ensemble singers and dancers do a fabulous job throughout, required to change focus, nationality, and style as the musical progresses. Everything about this show is huge in scale – everything, that is, except the chess board, which those with long memories may recall was much larger in those early productions. This is a big, loud, dynamic show which is about as 80s as you can get. For those of us who grew up with it, it is a little corner of musical theatre heaven. For those of you not sure, go if you can. It’s like Marmite, so you may hate it – or you may not. In any case, I would be surprised if a big production is put on in the West End again. Chess is on a limited engagement at the ENO Coliseum, and closes on the 2nd June 2018. I am visiting again this weekend, and will update this review after that – I felt that despite the greatness of the show, it cannot be fully appreciated from the poor sightlines of the upper levels, and I look forward to reporting back from a more premium seat at my next visit. You’re probably very familiar with the story of Tina Turner – born Anna Mae Bulloch. She was spotted by Ike Turner when she was a teenager and her distinctive and powerful voice livened up his Revue Band for sixteen years of music success and violent domesticity. The first act of this musical starts in church, when young Anna Mae already seeks attention. Abandoned by her parents she becomes a cotton picker and grows under the care of her grandmother. On rejoining her mother and elder sister she runs wild and is practically pushed towards the much more worldly Ike, who grooms her into marriage while resenting her superior talent. Of course we only have Tina’s word about these early years, and by the end of Act One she’s taken her two boys and made a run for it. There are some musical bits in this half, but the show didn’t come to life for me until Proud Mary. Act Two sees Tina, ‘knocking forty’ and without a record deal. She’s taken on by a Aussie producer and finds herself on the other side of the world, with a new image, a new partner in marketing whizz Erwin Bach, and eventual super-stardom. Adrienne Warren is note-perfect as Tina, from teenage years to mature rocker. She has her first chance to show off her pipes on River Deep, Mountain High and comes into her own with vibrant energy in the Simply The Best finale. Produced by Turner and Bach, this show is close to hagiography, with the story clearly slanted to the infatigable determination of Anna Mae. Young Anna Mae is played by a rotating trio of girls (I think we saw Reya-Nyomi Brown) with their own infectious spirit. Lorna Gayle is in great voice as GG, Tina’s gran, and Kobna Holdbrook-Smith convinces in a tough role as Ike – he gets booed as the villain but he’s a good singer in his own right. Interestingly, Tina’s solo success comes with a step away from the black community and with the help of whites like Phil Spector, Rhonda Graham, Terry Britten and Roger Davies. Even from David Bowie, who reportedly told the record label they would be mad not to sign her – there’s a moment where I thought he would be introduced but thankfully, no. A decent show but it could do with a bit of a snip and be warned, it takes a while to warm up. Go for Warren’s performance though – she really is that good. There are as many different types of song in MT as there are shows – big belters, ballads, showstoppers, choruses, comic theatricals, and curtain-raisers. In this post I’ll share some of my favourite sad songs, tearjerkers, items of pathos, musical beauties. This takes in examples from between the world wars through to the present day: I hope I’ve included some of your favourites. Kern and Hammerstein: in creating Show Boat a couple of classic love songs were launched. ‘You Are Love’ brings Gaylord and Magnolia together, while ‘Bill’ gives Julie a torch song of regret; the use of a turn of the century stage favourite by Charles Harris, ‘After the Ball’, focuses on father and daughter meeting after a separation. Rodgers and Hart: ‘Bewitched, Bothered and Bewildered’ from Pal Joey. An anthem of awakened feelings from an older lady. ‘My Romance’, from Jumbo, love in the circus. ‘With a Song in my Heart’, which was a film number, not stage, but beautiful. Rodgers and Hammerstein: ‘Something Wonderful’ and ‘Hello, Young Lovers’ from The King and I, where Anna Leonowens finds purpose in Siam. ‘People Will Say We’re In Love’ from Oklahoma, Curly and Laurey’s unsure steps. ‘If I Loved You’ and ‘Soliloquy’ from Carousel, where bluff Billy almost softens. ‘Do I Love You Because You’re Beautiful’ from Cinderella, done twice for TV before making it to the stage. ‘This Nearly Was Mine’ from South Pacific, when Emile feels he has lost Nellie, who has been ‘carefully taught’ to fear the unknown. Andrew Lloyd Webber: ‘I Don’t Know How To Love Him’ from Jesus Christ Superstar. ‘Other Pleasures’ and ‘Seeing is Believing’ from Aspects of Love, an underrated circle of love and desire. ‘Old Deuteronomy’ from Cats. ‘As If We Never Said Goodbye’ and ‘The Greatest Star of All’ from Sunset Boulevard. ‘An Unexpected Song’ from Tell Me On a Sunday, just breathtaking. Stephen Sondheim: ‘Little Lamb’ from Gypsy. ‘Send in the Clowns’ from A Little Night Music. ‘Losing My Mind’ and ‘The Road You Didn’t Take’ from Follies. ‘Move On’ from Sunday in the Park With George. ‘Being Alive’ from Company. He has such an eye for the real detail. Abba musicals: ‘Pity the Child’ and ‘Anthem’ from Chess. ‘Slipping Through My Fingers’ from Mamma Mia, mothers and daughters. Willy Russell: ‘Tell Me It’s Not True’ from Blood Brothers. The tale of twins as alike as two pins. Richard O’Brien: ‘I’m Going Home’ and ‘Once In Your Life’ from The Rocky Horror Show. Strangely touching. Gershwin: ‘Summertime’ and ‘I Loves You, Porgy’ from Porgy and Bess. ‘But Not For Me’ from Girl Crazy. Boublil and Schoenberg: ‘Bring Him Home’, ‘I Dreamed a Dream’ and ‘I Saw Him Once’ from Les Miserables. ‘The Movie in My Mind’, ‘Bui-Doi’ and ‘I’ll Give My Life for You’ from Miss Saigon. ‘When Will Someone Hear’ and ‘How Many Tears’ from Martin Guerre. Big belters with a lot of heart. Bernstein: ‘Make Our Garden Grow’ from Candide. ‘One Hand, One Heart’ and ‘Maria’ from West Side Story. Ivor Novello: ‘My Dearest Dear’ from The Dancing Years. ‘We’ll Gather Lilacs’ from Perchance to Dream. Of their time operettas, but beautifully done. Noel Coward: ‘If Love Were All’ from Bitter Sweet. ‘Matelot’ from Sigh No More. Peggy Gordon: ‘By My Side’ from Godspell. A beautiful blend of melodic voices. ‘I Don’t Need a Roof’ and ‘Daffodils’ from Big Fish, a new musical with a lot of heart. Lerner and Loewe: ‘I Could Have Danced All Night’ from My Fair Lady. ‘It’s Almost Like Being in Love’ from Brigadoon. ‘Wand’rin Star’ from Paint Your Wagon. ‘How To Handle a Woman’ and ‘Before I Gaze at You Again’ from Camelot. The title song from ‘Gigi’, as Gaston falls in love. Five musicals which need big ticket revivals. Irving Berlin: ‘It’s a Lovely Day Tomorrow’ from Louisiana Purchase but best known for the version by Vera Lynn. ‘They Say It’s Wonderful’ from Annie Get Your Gun, a sweet pause in a raucous sea of sound. Jerry Herman: ‘If He Walked Into My Life’ from Mame. ‘I Won’t Send Roses’ from Mack and Mabel. ‘Song on the Sand’ from La Cage Aux Folles. Naked, honest, what ifs. Bock and Harnick: ‘Sunrise, Sunset’ from Fiddler on the Roof. ‘Summer’s here and the time is right for dancing in the street’. Well, it isn’t summer yet but it is time to check out this hagiography about Berry Gordy written by, um, Berry Gordy, in a show he also produced. Veering between an obsession with Motown star (and Gordy girlfriend) Diana Ross, and the frankly misguided decision to force more than 50 songs into a threadbare narrative, this show only stands on the quality of its songs, which thankfully are good. There are four big roles and a hard working cast of ensemble and swings who play the rest – at the performance I saw Ashley Samuels was in great voice as Gordy, Kieran McGinn was a bit superfluous as Smokey Robinson (really, all those great songs missing, a waste of this performer’s voice), Lucy St Louis was spirited but no Ross, and Kayi Ushe was the very spirit of Marvin Gaye. A feelgood jukebox show cluttered with simplistic political commentary about the deaths of President JFK and Dr King, and Vietnam, this show works best when acts are simply allowed to perform (Jay Perry impresses, for example, as both David Ruffin of The Temptations and as Jermaine Jackson), and the medley of dubious 70s acts signed by Gordy really needs to go! Wigs and stick-on beards are awful, though, and the set is a tad on the cheap side. Ultimately this is a bloated ego trip which doesn’t quite do full justice to the songs (and I would have liked to hear more from Diana Ross as Billie Holiday), and it pales in comparison to other jukebox shows such as ‘Beautiful’ or ‘Sunny Afternoon’. Before I put together this review of the musical which started in Sheffield and which now has a new life in the West End, I tracked down the original documentary on which it is based – Jamie: a drag queen at 16 – and watched the basic story of how gay teenager Jamie Campbell was supported by his mother, family friend Lee, best friend Sam(antha), and drag queen Simon to achieve his dream of having a drag show and of taking that character to the school prom. Jamie Campbell and John McCrea, photo by James Stewart. Three years in the making, the musical version takes Jamie (now with the surname New) and his mother Margaret, and the basic plot, as jumping-off points to present a narrative filled with pulsating dance beats, big ballads, and racially diverse characters (Lee, a white woman, is now Ray, an Asian woman, and Sam has become the hijab-wearing Pritti (Lucie Shorthouse, who gives what could be a stereotypical character an interesting slant)). After watching the documentary it feels a bit of a shame that stage Jamie’s final prom dress is so understated, and you only ever see the famous make-up from the posters just once, as ‘Mimi Me’ struts her stuff on the Legs Eleven stage. John McCrea (who I saw last some years ago in The Sound of Music as the eldest Von Trapp boy) totally convinces as the teen who is working through both confusion and confidence, and when his doting mum purchases a dazzling pair of red high heels for his birthday, he walks in them as if he’s been wearing them all his life. 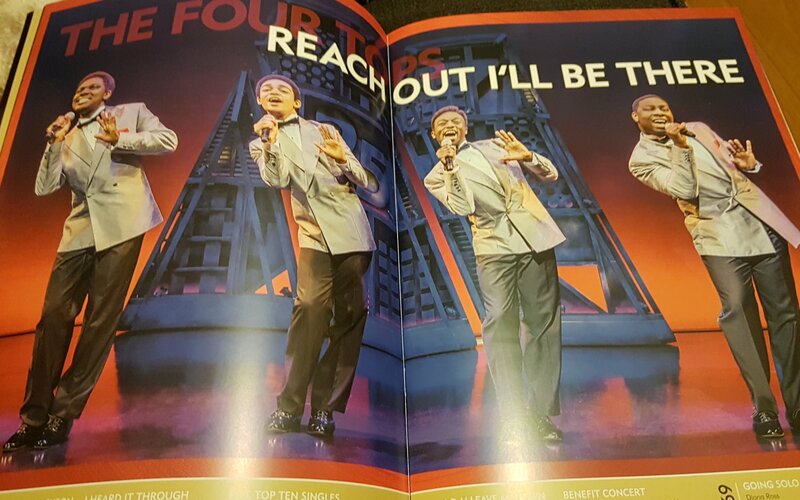 The big production numbers are all set in the schoolroom (‘And You Don’t Even Know It’; ‘Work of Art’; ‘Out of the Darkness’), while the slower songs – Jamie’s ‘The Wall in My Head’ and ‘Ugly in This Ugly World’; and Margaret’s ‘If I Met Myself Again’ and ‘He’s My Boy’ are in the home or elsewhere (maybe in a single spotlight). At the performance I saw, Rebecca McKinnis was on as Margaret, and both her acting and singing were superb. I also enjoyed the lovely and understated performance of Phil Nichol as Hugo/Lolo Chanelle and the ‘out there’ shenanigans of real-life drag queens Alex Anstey and Daniel Jacobs, who perform as Vileda Moppe and Vinegar Strokes respectively out there, and as Laika Virgin and Sandra Bollock here; they are joined by James Gillan, a former Marilyn in the Boy George musical Taboo, and who doesn’t feel out of place. This is a truly life-affirming musical, with memorable tunes and lyrics by Dan Gillespie Sells and Tom MacRae, and if it is a little corny, and extremely camp, it doesn’t care. I would have snipped out the bigoted dad, and toned down the pantomime queen teacher, and made Jamie really put himself out there, but these are small quibbles. The musical is about the importance of being yourself rather than hiding behind what others might want you to be, and that message comes out loud and clear, with the audience accomplices in the claps, cheers and whoops that the cast, the fabulous band, and the book (both funny and tragic) deserve.